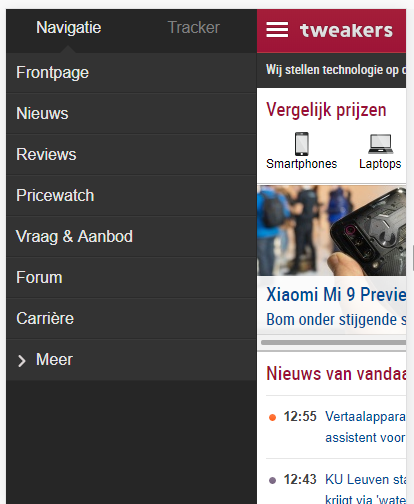 Does the Porto template offers the option for a collapsable side-menu? I want to place it in the sidebar. It does not replace the header, but it’s meant for selectable categories (multi-level). With some custom code we can do that. That’s great to start with! I do have 2 (or 3 actually) additional wishes though. 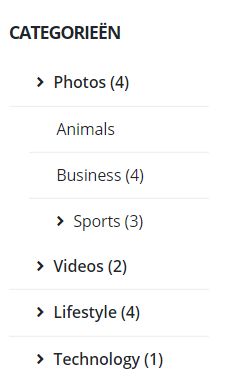 1) I would like the collapsible categories (with subcategories) to be clickable as a link as well. So the parent category itself is a link, but is also collapsible to show it’s subcategories. 2) I would like to add another 1 or 2 levels. So subcategories can have subcategories of their own again. I would also like to change the indenting to have some more space for the subcategories. This reply was modified 2 months, 1 week ago by Marty. In that case please use the code below. You can delete the JS code of previous solution. Almost perfect! I just need to fix the indenting, so the multiple levels of categories fit in the sidebar. Basically we removed the margin from <ul> with the class ml-0. Perfect! Last thing, I want to reduce the left-margin for the parent categories as well. And reduce the left-margin for the subcategories even further, since left-margin=0 still leaves pretty much white space. Can you help with that? This is how it looks now, I want to reduce left-margin on parent categories and a little bit more reduce of left-margin on subcategories. If a category is collapsed, I would like the font-awesome icon to change from [+] to [-] (I already have the icons instead of the arrows, just need to change it on collapse) is this possible? 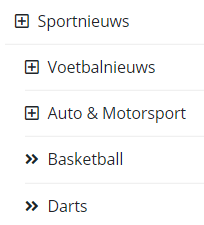 So in this image, Sportnieuws should have [-] instead of [+] because it is already collapsed. It does show the minus-square after a category is collapsed, however it also shows the minus-square initially on page load. Default should be the plus square, the minus square should only be shown when a category is collapsed. How can I set the initial icon to plus square? Also, there could be an active category. I want that concerned category to be collapsed on page load and also show the minus square icon, because it is already collapsed. Thanks! The menu is perfect now on desktop. For mobile, I would like the menu to be expandable (preferably) from the side with hamburger icon. Is this possible? – Can I also show/hide div’s on mobile devices? – Can I change the order of div’s on mobile devices? Can you explain with more details ? What I meant is hiding the category menu on mobile and only show it as a side-menu when a hamburger-icon is clicked.